This document, Kernel Build HOWTO, is copyrighted (c) 2004 by Kwan L. Lowe. Permission is granted to copy, distribute and/or modify this document under the terms of the GNU Free Documentation License, Version 1.2 or any later version published by the Free Software Foundation; with no Invariant Sections, with no Front-Cover Texts, and with no Back-Cover Texts. A copy of the license is available at http://www.gnu.org/copyleft/fdl.html . Why rebuild the kernel? The main reason was once to optimize the kernel to your environment (hardware and usage patterns). With modern hardware there is rarely a need to recompile unless there is a particular feature of a new kernel that you must have. The performance gains are probably not noticeable unless specific benchmarks are being run. This said, the newest Linux kernel (2.6.5 as of this writing) has noticeable improvements for the typical desktop user as a result of the improved scheduling system in the new kernel. Even for older kernels, rebuilding is often necessary for low memory situations, esoteric hardware, and in cases where every ounce of performance must be extracted. This guide covers the steps necessary to build both the 2.4.x and 2.6.x series of kernels. Because the process is quite different from one version to the next, the two kernel versions are described in separate chapters. The Linux kernel is often likened to the conductor in an orchestra. Among other things, it makes sure that all other processes in the system work together coherently. Though it is only a small part of the operating system, the kernel has the most important job of keeping everything else synchronized. Hardware requirements can differ greatly between kernel versions, and indeed, within versions depending upon the configuration. Though the Linux 2.4.x kernel can boot with as little as 8M of RAM, a more realistic number is about 64M. As of this writing, the published minimum hardware required for the typical distribution is about 128M RAM, 2G of hard drive space, and 200MhZ Pentium or equivalent CPU. To actually build the kernel, however, requires a little extra hardware. The kernel sources themselves will occupy anywhere from 40M to 80M of filesystem space. To build them requires a minimum of 400M of drive space for all the interim files. The actual kernel and included modules will require anywhere from 4M for an almost useless, bare minimum kernel to about 40M fully loaded. Luckily, the kernel does not need to be built on the same machine on which it will be deployed. This means that you can compile and package your kernel on a more robust machine and then install on the minimal system. Once you have determined that your hardware and software meet the minimum requirements for the kernel build, we will need to collect more detailed information about the system. This is needed during the configuration process when we decide which hardware will be supported under our new kernel. Among the information we will gather include: Processor, Drive type and Controller (SCSI, IDE), Ethernet devices, Graphics and Sound Cards, USB HUB. There are many ways to acquire the Linux kernel sources. If you are using a packaged distribution then most likely the distributor will bundle a kernel source package. These are installable via the package installation method, whether RPM, apt, YAST, portage, etc.. If you decide to go this route, please consult your distribution's documentation for specifics. The other option is to use the "pristine" sources, either the "official" sources from Linus Torvalds himself, or one of the regularly maintained trees from people such as Alan Cox, Robert Love, Andrew Morton, et al.. These sources are often on the bleeding-edge of kernel development, full of new features and untested code. Untested code? This is a feature of the distributed development model of Linux and Open Source (??) in general. The traditional model of a software release is somewhat antithetical to this model, as new code must be released to allow all developers to test and improve the code. However, because Linux is used in production environments throughout world it is necessary to separate the unstable development tree from the tested, stable tree. This is done through the version number of the kernel. There are three main numbers associated with the kernel -- the Major, Minor, and PatchLevel fields. The Major number rarely changes, and then only when/if the entire architecture is revamped. The Minor number changes more frequently, perhaps once every couple years. Kernels with an odd Minor number are considered unstable, testing branches. Kernels with an even Minor number are generally rock solid. The PatchLevel is updated frequently, sometimes more than once a week in extreme cases. To recap, you can build either from your distribution's modified kernel sources or from the stable or unstable branch of the offical sources. If you are making minor modifications to the configuration, it is perhaps safest to install your distributor's version. These kernels usually include stability and feature patches that may be missing from the stock kernels. For example, some distributors will include low-latency or security patches and do the more difficult work of integrating these into their system. The downside is that the distributors tend to lag behind the bleeding-edge kernels. If you would like to test features that are available in the newest tree then you will likely need to build from the "pristine" source from Linus or the tree maintainer of your choice.. FIXME: NO LONGER really true -- 2.6 based distributions are out there / will be (e.g., SuSE 9.1) by the end of April 2004. Though the latest sources are always available from http://kernel.org, to be kind to the Internet, always use one of the mirrors listed at http://kernel.org/mirrors. In general, geographically close mirrors will tend to be fastest. You can either browse the sites with an Internet browser or with a dedicated FTP client. You will see several links to /pub/linux on the mirror site. Select the kernel directory, then the kernel version that you would like to install. As of this writing, 2.4.22 is the latest stable version and 2.6.0 is in pre-release state. Once you select a kernel version you will see several files. The Changelog files detail the differences between versions. The linux- files are the compressed sources for the entire Linux kernel. Most sites will contain both gzip and bzip packages. The bzip packages tend to be about 20% smaller than the GZIP versions, so they are usually the best option since all modern Linux distributions contain BZIP utilities. The patch files are a list of differences between versions of the kernel. If you have previously downloaded an earlier source package, you will only need to download the much smaller patch file to bring those up to date. We will discuss patch application in the next section. There are also some .sign files that contain GPG checksum information which are useful for verifying that the sources you downloaded have not been corrupted or maliciously modified. For more information on verifying the GPG signature, see http://www.kernel.org/signature.html . The http://kernel.org website is not the only place to retrieve patches. Many other vendors and individuals have developed patches to improve aspects of the kernel's performance, support new hardware, or introduce features that are too esoteric or experimental to make it to the stock kernel. For example, kernel hacker Robert Love had developed the pre-emptible kernel modifications that made dramatic improvements to the responsiveness of a Linux system. These patches were not part of the standard 2.4.x kernel but were of such usefulness that they were officially adopted into the 2.6.0 series. For the most part these third-party patches are stable but do use your judgment when downloading and applying them. We will begin by creating a directory to hold all the source tarballs and patches, then proceed to extract the sources. For these examples we will assume that you have previously downloaded an earlier release of the kernel and will now need to patch to bring it up to the current version. Next we must apply the patches in order. Patch files are created by the diff program, and can selectively modify one or more files by adding, deleting, or modifying lines in the source code. Because they contain only the differences between files it is usually a lot faster (and better for the Internet in general) if you patch to the current release. (TBF unclear). Appendix TBF shows a typical patch file. Like the kernel sources, the patch files are also compressed. Once the patches are uncompressed we can apply them to the kernel sources. Remember that it is important to apply them in order. If unsuccessful you will get a warning and be prompted for a file to patch. If this occurs, press Ctrl-C to break out of the patch utility and verify that you are using the correct patch and applying them in the correct order. Once all the patches are applied you might consider backing up the directory. The configuration process is the most strenous portion of the kernel rebuild process. In this step you are deciding which features will be included in the final kernel and it can require lots of hardware knowledge. In truth, it is not too onerous. The current kernels have graphical configuration programs and though not perfect, provide help screens for most of the configuration options. Many changes were made to the configuration subsystem in the 2.6.x kernel series. It is easier to add modules and much more robust than before. It has also changed dramatically in appearance especially when using the X-based configuration tool, xconfig. For this reason the configuration steps for the different branches have been split into two sections in this chapter. As mentioned, both configuration tools provide context sensitive help screens for the different options. Because this help is readily available to the user (and more importantly, because there are several hundred options) this guide will only cover a fraction of the choices. We have so far extracted and patched the Linux sources. During our preparation we also determined what hardware is installed in the system so that we will know which modules will need compilation. Before we proceed to actually configuring the kernel there are a couple minor but important details to complete. Note that there is an additional EXTRAVERSION field. To prevent overwriting any existing kernel modules on the system we will change this EXTRAVERSION to something unique. When the final installation steps are run, kernel module files will then get written to /lib/modules/$VERSION.$PATCHLEVEL.$SUBLEVEL-$EXTRAVERSION. If you are using the sources from a vendor, then the default configuration files are usually included in the configs or in the ./arch/i386/defconfig (for i386 machines) file. You can use these configurations as a starting point for your customizations. The .config will be overwritten in the next step, so do make a backup before proceeding! We begin the configuration by wiping out all previous configurations and resetting the source directory to a pristine state. The main reason for doing this is that some files do not automatically get rebuilt, which can lead to failed builds, or at worst, a buggy kernel. In the 2.4.x series, a few dozen lines of rm -f commands will appear as all generated files get removed. The 2.6.x process is less noisy and returns only a few CLEAN messages. Please note that it is generally safe to omit the make mrproper step during subsequent rebuilds. As of this writing (December 15, 2003), the 2.4.x kernel is in wide deployment. The 2.6.0 has just been released to the world. FIXME -- the previous sentence needs to be updated Though the configuration and build procedures are quite similar, there are enough differences to warrant separate sections for each kernel. If you are building a 2.6.x series kernel, skip to the Section called Configuring the 2.6.x kernels. Otherwise, proceed to the next section, the Section called Configuring the 2.4.x kernels. config is the least user-friendly option as it merely presents a series of questions that must be answered sequentially. Alas, if an error is made you must begin the process from the top. Pressing Enter will accept the default entry, which is in upper case. oldconfig will read the defaults from an existing .config and rewrite necessary links and files. Use this option if you've made minor changes to source files or need to script the rebuild process. Note that oldconfig will only work within the same major version of the kernel. You cannot, for example, use a 2.4.x .config with the 2.6.x kernel. xconfig, as the name suggests, is an X Window based frontend. It requires the Tcl/Tk and X libraries to work, and of course, an X server. Figure 2 shows an example screen. The main configuration menu will appear. Selecting an item will bring up another window with further options. These in turn can spawn other sub-menus. This option allows configuration of alpha-quality software. It is best to disable this option if the kernel is intended for a stable production system. If you require an experimental feature in the kernel, such as a driver for new hardware, then enable this option but be aware that it "may not meet the normal level of reliability" as tested code. You will almost certainly want to enable module support. If you will need third-party kernel modules you will also need to enable Set Version Information on All Module Symbols. This is perhaps the most important option to choose. In the Preparation section we determined our processor type by examining /proc/cpuinfo and we use that information here to select the appropriate processor. Included in this submenu are features such as Low Latency Scheduling which can improve desktop responsiveness, Symmetric Multi-processing Support for machines with multiple CPUs, and High Memory Support for machines with more than 1G of RAM. Laptop users can also benefit from the CPU Frequency Scaling feature. Choices for PCI, ISA, PCMCIA and other architectural support such as Advanced Power Management are found here. MTD devices include Compact Flash devices. Some digital cameras will require this support. The Block Device section contains options for floppy and hard drives, including parallel port devices, tape drives and RAID controllers. Important options include loopback device support, which allows mounting on disk images, and initrd support, which is needed to preload drivers necessary to boot the system. Important for servers, these options include RAID support for combining multiple disks. Note that this option is not needed for certain hardware RAID that function below the operating system level. LVM is a useful subsystem that allows, among other things, dynamic resizing of filesystems. This section includes options for IDE/ATAPI chipsets, including performance tweaks such as DMA. Most systems will need this support. Useful options include Loopback Crypto Support, which allows encrypted filesystem images to be mounted. Even with full access to the PC, loopback encryption can help safeguard data. Many choices are available for networking. TCP/IP, IP tunneling, packet filtering, IPv4 and IPv6, routing support and network QoS are among the most useful. If your kernel is intended for a dedicated firewall or router device, then the options here can significantly improve performance. Read the online and kernel documentation. SCSI support is needed for not only true SCSI devices, but also for IDE CDR/W drives in SCSI emulation mode. If your root filesystem is mounted on a SCSI disk, then you must build support directly into the kernel and not as a module. Dozens of options are available here, including support for many serial and parallel devices, hardware sensors (for system monitors), mice, joysticks and DRM. Many of the options can be safely disabled without problem. It is a good idea to build support for your root filesystem directly into the kernel. Though the initrd utilities can get around the chicken-and-egg boot problem, it is generally safer and easier to just build the fs modules directly. Many options can also be safely disabled if you have no use for the feature. Once all the configuration changes have been made, you can go ahead and save settings. By defaulti, the configuration is placed in the .config file in the topmost directory. Because this file is deleted by make mrproper and is also hidden, it is a good idea to use the Save to Alternate File before exiting. It will prompt for another save location. Enter something outside of the source tree and with a useful name such as kernel-2.4.22-lowlatency.config. Once this is done, exit the configuration menu. You will be prompted to save the configuration again. Select Yes and continue. The configuration for the 2.4.x kernel is now complete. You may now skip to the chapter called Build. Our next step is to run the configuration utility. On the 2.6.x kernels there are four main frontend programs: config, menuconfig, and xconfig. config is the least user-friendly option as it merely presents a series of questions that must be answered sequentially. Alas, if an error is made you must begin the process from the top. Pressing Enter will accept the default entry which is in upper case. oldconfig will read the defaults from an existing .config and rewrite necessary links and files. Use this option if you've made minor changes to source files or need to script the rebuild process. menuconfig is an ncurses based frontend. Your system must have the ncurses-devel libraries installed in order to use this utility. As the help text at the top of the screen indicates, use the arrow keys to navigate the menu. Press Enter to select sub-menus. Press the highlighted letter on each option to jump directly to that option. To build an option directly into the kernel, press Y. To disable an option entirely, press N. To build an option as a loadable module, press M. You can also access content-specific help screens by pressing ? on each page or selecting HELP from the lower menu. Figure 1 in the Section called Configuring the 2.4.x kernels shows an example screen from the 2.4.x kernel series. as a module. Clicking on the box will cycle through the three states. should be present, try turning on Show All Options under the Options menu. still view the help of a grayed-out option. The system will take a few moments to build the configuration utility. Next you will be presented with the configuration menus. Though similar to the 2.4.x series, the 2.6.x menu is more logically organized with better grouping of sub-modules. 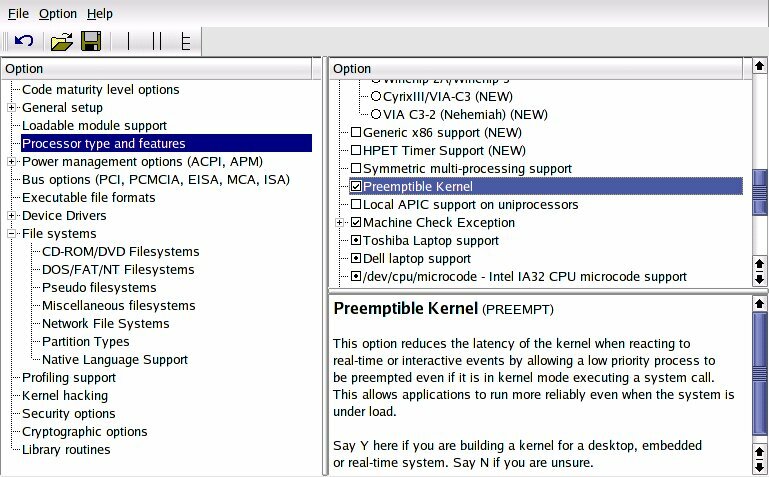 Following are some of the top level configuration options in the 2.6 kernel. This option allows configuration of alpha-quality software or obsoleted drivers. It is best to disable this option if the kernel is intended for a stable production system. If you require an experimental feature in the kernel, such as a driver for new hardware, then enable this option but be aware that it "may not meet the normal level of reliability" as more rigorously tested code. This section contains options for sysctl support, a feature allowing run-time configuration of the kernel. A new feature, kernel .config support, allows the complete kernel configuration to be viewed during run-time. This addresses many requests to be able to see what features were compiled into the kernel. This is perhaps the most important configuration choice. In the Preparation section we determined our processor type by examining /proc/cpuinfo and we use that information here to select the appropriate processor. Included in this submenu are features such as Preemptible Kernel which can improve desktop responsiveness, Symmetric Multi-processing Support for machines with multiple CPUs, and High Memory Support for machines with more than 1G of RAM. Found here are options for ACPI and CPU Frequency Scaling which can dramatically improve laptop power usage. Read the Documentation/power file for more information. Here are found options for all system bus devices. On modern machines the ISA and MCA support can often be disabled. Interesting features here include the kernel support for miscellaneous binaries, which can allow seamless operation of non-Linux binaries with a little userland help. All the device-driver configuration options that were previously scattered throughout the 2.4.x menus are now neatly organized under this option. Features such as SCSI support, graphic card optimizations, sound, USB and other hardware are configured here. Found here are options for filesystems which are supported by the kernel, such as EXT2 and ReiserFS. It is best to build support for the root filesystems directly into the kernel rather than as a module. Interesting options here include support for NSA Security Enhanced Linux and other, somewhat experimental, features to increase security. The next step is to create the necessary include files and generate dependency information. This step is only required for the 2.4.x kernel tree. Lots of messages will scroll by. Depending on the speed of your machine and on what options you chose, this may take several minutes to complete. Once the dependency information is created we can clean up some miscellaneous object files. This step is required for all versions of the kernel. The freshly baked modules will be copied into /lib/modules/KERNEL_VERSION. simple to build and use kernels using modular device drivers. If your build fails with a signal 11 error it is most likely because of hardware problems; often the culprit is failing memory. Unfortunately, the BIOS memory check is close to useless in detecting intermittent memory failures. Even dedicated memory checkers do not stress memory as much as gcc running a kernel build. One way to tell if hardware is at fault is to restart the 'make bzImage' process. If you can get a little further before failing again then it is a hardware error. There are several possible ways to try to correct these. Try changing your memory settings in the BIOS to more conservative levels. For example, change to SLOW or NORMAL instead of FAST. Verify that all the fans are working correctly. Swap out the memory. One trick is to specify less memory than is actually installed by passing values to the kernel on boot. This prevents the kernel from accessing all the memory in the machine, and could help diagnose bad SIMMs or SDRAMs. If instead the 'make' fails at the same point each time, then it is a configuration error. These usually result from not enabling a feature that is required by another. For example, IP Firewalling requires TCP/IP. If the prerequisite is not enabled, the build will fail. You may also get errors if you select the wrong processor or are using either a very old or development compiler. Also keep in mind that the kernel is highly sensitive to the versions of the build tools such as the compiler and linker. The versions listed are requirements, not suggested. The next step is to configure your bootloader. The bootloader is the first program that runs when a computer is booted. For this document it is assumed that you are running an IA32 system with a standard PC BIOS. If you are running the LiLO bootloader skip to the the Section called LiLO Configuration otherwise proceed to the Section called GrUB Configuration. FIXME: Need information on non-IA32 bootloaders!! GrUB is beginning to supplant LiLO as the bootloader of choice in more recent Linux distributions. It is generally more flexible and a lot more forgiving of system errors. For example, LiLO generally requires that an alternate boot disk is used if the kernel configuration renders the system unbootable Grub allows "on-the-fly" modification of kernel location, boot parameters, kernel to boot, etc..
Once you have copied the bzImage and System.map to /boot, edit the grub configuration file located in /boot/grub/menu.lst. On some distributions /etc/grub.conf is a symbolic link to this file. LiLO is an older bootloader. Its configuration file is located in /etc/lilo.conf on most systems. Unlike GrUB, any changes to lilo.conf will not be set until the lilo program is rerun. The important sections are the image=/boot/bzImage and the default=test-2.6.0 options. Notice that you can have several image sections in the lilo.conf, allowing multiple configurations. Install the new kernel by running the lilo program. Messages will appear showing the newly added kernel with an asterisk marking the default image. If you get errors, consult the lilo documentation for the correct syntax. [LinuxKernel] Daniel P. Dovet and Marco Cesati, 2003, Edited by FIXME FIXME, 0672325128 , SAMS, Linux Kernel Development. The current maintainer of this HOWTO is Kwan Lowe. Please send corrections, additions, comments and criticisms to <kwan@digitalhermit.com>. Written in DocBook 4.1 SGML. Vim was used to create the SGML source file. The HTML, PostScript and PDF output was generated from the DocBook source by the Linux Documentation Project. I have successfully installed a serviceable machine on an original Pentium 100, 64M RAM, and 1.2G of drive space. A full build of the 2.6.0test9 kernel took approximately 4 hours to complete. Distributions will often install the kernel sources into /usr/src/linux. To build in this directory will require root access. Note that there are usually two source packages -- one called something like kernel-source-VERSION-i386.rpm and another called kernel-VERSION.src.rpm. You can generally rebuild the src.rpm as an unpriveleged user. This is a relative thing. The initrd utility is robust and easy to use. Bootloaders have also improved to the point that little effort is saved by using static kernels. My two cents. I have noticed some minor screen corruption when using menuconfig in slightly non-standard terminals. Though it functions normally some of the menu entries may be difficult to read until the screen is refreshed. The difference between 'zImage' files and 'bzImage' files is that 'bzImage' uses a different layout and a different loading algorithm, and thus has a larger capacity. Both files use gzip compression. The 'bz' in 'bzImage' stands for 'big zImage', not for 'bzip'! At this writing there are some issues with the modules.conf when moving from 2.4 to 2.6 kernels. Some module names have changed which seems to cause glitches with initrd. For a long while, I thought that the xmatrix screensaver was crashing my machine because of the numerous core dumps I would discover in my home directory. It turned out that xmatrix was cpu intensive. Unknown to me, the CPU fan on this machine had failed. Everything was fine until xmatrix started, causing the processor to overheat, eventually leading to a crash. People should be warned that if their partition is too small, the bzImage will not fit, and the boot procedure will fail.